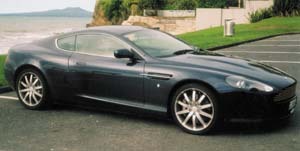 Aston Martin DB9. 2004 to date (prod. unknown). 2-door coupé, 2-door convertible. F/R, 5935 cm³ (V12 DOHC). Lovely grand tourer from Aston Martin, with initial styling by Ian Callum. Not DB8—Aston did not want people thinking it was a mere V8. Far roomier—no XJ-S base compromises—and far more technologically advanced than its predecessor. Power at 450 bhp at launch, uprated to 470 in 2007. Very low, and suitable mostly for true grand touring.